I am resending this devotional, “A steadfast Hope,” because I have added the last paragraph, as well as a personal note from Gayle and I, and our family. I hope you will take the time to read the devotional again and note our family news at its end. Your prayer is especially appreciated in these next days. With Christ in your life, your past is erased, your present is blessed, and your future is certain. 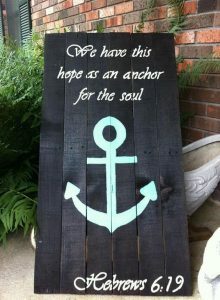 “We have this hope as an anchor for the soul, firm and secure.” Hebrews 6:18 NIV. Paul reasoned, “For we were saved in this hope, but hope that is seen is not hope; for why does one still hope for what he sees? But if we hope for what we do not see, we eagerly wait for it with perseverance.” Romans 8:24-25 NKJV. True hope begins, rests, and thrives in this truth, “Christ in you, the hope of glory.” Colossians 1:27 NKJV. Contrast that with life before your heart was at rest in Christ. “At that time you were separate from Christ . . without hope and without God in the world.” Ephesians 2:13 NIV. With Christ in your life, your past is erased, your present is blessed, and your future is certain. “[We who] take hold of the hope offered to us may be greatly encouraged. We have this hope as an anchor for the soul, firm and secure.” Hebrews 6:18-19 NIV. Biblical hope rests, “firm and secure,” upon the clarity of God’s Word to you and the surety of Jesus Christ’s work in you. Hope is akin to love and faith, not a weaker version of either. Paul affirmed the Thessalonian Christians, “Remembering without ceasing your work of faith, labor of love, and patience of hope in our Lord Jesus Christ” 1 Thessalonians 1:3 NKJV. He similarly encouraged the Christians in Corinth, “And now abide faith, hope, love, these three; but the greatest of these is love.” 1 Corinthians 13:13 NKJV. Biblical hope deserves more priority than is usually given. “Let us hold on firmly to the hope we profess, because we can trust God to keep His promise.” Hebrews 10:23 TEV. Paul prayed for the Roman church, “May the God of hope fill you with all joy and peace as you trust in Him, so that you may overflow with hope by the power of the Holy Spirit.” Romans 15:13 NIV. You experience overflowing hope as you fill your thoughts and heart with God’s Word. “That we through the patience and comfort of the Scriptures might have hope.” Romans 15:4 NKJV. When things aren’t working out as expected, choose hope anyway. Losing hope for your marriage or family? Place your home in God’s hands. God can mend hearts, restore love, and heal a marriage. Giving up on yourself or someone else? God can change a life. Struggling with finances? God is the Lord Who provides. As long as there is life there is hope. “Jesus Christ, Who according to His abundant mercy has begotten us again to a living hope through the resurrection of Jesus Christ from the dead.” 1 Peter 1:3 NKJV. The Resurrection is God’s way to show that nothing is impossible. Considering that day of Christ’s return and our glorification, Paul wrote of the Blessed Hope that awaits us, “Live self-controlled, upright and Godly lives in this present age, while we wait for the blessed hope – the glorious appearing of our great God and Savior, Jesus Christ.” See Titus 2:11-14 NIV. We look with even more anticipation for that glorious day. Today, I pray for you to experience hope that is undiscourageable and steadfast. The greatest gifts come from the benevolence of grace. “It is by God’s grace that you have been saved through faith.” Ephesians 2:8 TEV. Diligent people have an almost incurable work ethic, which comes with the assumption that the measure of reward correlates to your measure of effort. The belief that you will receive what you earn and get what you deserve seems inbred. But is it not true that sometimes you get more than you deserve while at other times you receive less than you earned? Paul observed, “Now to him who works, the wages are not counted as grace but as a debt [owed].” Romans 4:4 NKJV. Gratefulness seldom results from your own efforts and hard work; true and enduring gratefulness results from recognizing the unmerited grace that has been shown to you from God and others. “If by grace, then it is no longer of works; otherwise grace is no longer grace. But if it is of works, it is no longer grace.” Romans 11:6 NKJV. The greatest gifts come from the benevolence of grace. You don’t earn grace; you simply, joyfully, and gratefully receive it. “In our union with Christ Jesus, God raised us up with Him to rule with Him in the heavenly world. He did this to demonstrate for all time to come the extraordinary greatness of His grace in the love He showed us in Christ Jesus. For it is by God’s grace that you have been saved through faith. It is not the result of your own efforts, but God’s gift.” Read Ephesians 2:5-10 TEV. Grace is God’s initiative of your salvation; faith is your response in acceptance of His gift. See Romans 5:1-2 NIV. “For without faith it is impossible to please God, for He who comes to God must believe that He is and that He is the Rewarder of those who diligently seek Him.” Hebrews 11:6 NIV. The Apostle Paul marveled at what he could only describe as, “the extraordinary greatness of [God’s] grace,” whereby you and I have been saved by God’s grace. You and I could not deserve such an invaluable, indescribable gift nor could we ever earn it by our efforts. Paul recounts the shameful history of himself and ourselves, “spiritually dead because of your disobedience and sin . . destined to suffer God’s anger.” Ephesians 2:1-3 TEV. Paul then describes our indescribable God, “God’s mercy is so abundant and His love for us is so great . . He brought us to life with Christ. It is by God’s grace that you have been saved.” Ephesians 2:4-5 TEV. Neither your worthy achievements can negate your need for God’s grace nor can a shameful past remove you from the reach of His grace. Because of God’s love, we each require and receive His grace when we reach out in sincere faith to the Savior Who died for our sins. Don’t hesitate. If you need grace today, reach out in faith to Jesus. “He is able to save to the uttermost those who come to God through Him, since He always lives to make intercession for them.” Hebrews 7:25 NKJV. Salvation, as are all gifts from God, is by extraordinary grace received in obedient faith. “But when the kindness and love of God our Savior appeared, He saved us, not because of righteous things we had done, but because of His mercy. He saved us through the washing of rebirth and renewal by the Holy Spirit, whom He poured out on us generously through Jesus Christ our Savior, so that, having been justified by His grace, we might become heirs having the hope of eternal life.” Titus 3:4-7 NIV. Today, I pray for you to embrace grace in its fullest measure. Criticism hurts others while changing the critic for the worse. “I am doing a great work and I cannot come down.” Nehemiah 6:3 NKJV. Here’s what I know about criticism: you can expect it and you will be wise to evaluate it. Everyone experiences criticism, some is deserved and some is not. And you won’t like criticism when it occurs; it hurts. 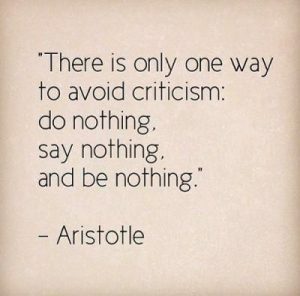 Criticism can mean that you are doing something that is not appreciated or approved by others. Occasionally, your critics may be right. In those times, criticism can be beneficial. Your challenge is two-fold. First, learn how to handle all criticism in a positive way. Secondly, learn to distinguish constructive criticism from destructive criticism. Constructive criticism is helpful. 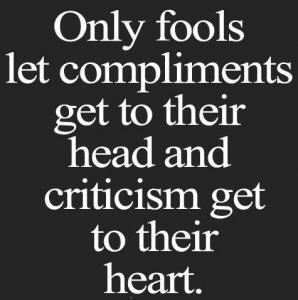 Solomon wrote, “If you listen to constructive criticism, you will be at home among the wise. If you reject criticism, you only harm yourself; but if you listen to correction, you grow in understanding.” Proverbs 15:31-32 NLT. Destructive criticism can hurt more than your feelings. But be careful; the first often feels very much like the latter, even when it’s not. Harmful criticism can change your motivation, dampen your passion for doing the right thing, or cause greater concern for pleasing people than pleasing God. “Our purpose is to please God, not people. He is the one who examines the motives of our hearts.” Read 1 Thessalonians 2:4-6 NLT. Don’t wrap yourself in the protective coat of not caring what others say or think. Of course, you care; you should. Just be sure you care most about what God says and thinks. “We ask God to give you a complete understanding of what He wants to do in your lives and we ask Him to make you wise with spiritual wisdom.” Read Colossians 1:9-11 NLT. Amen to that! It won’t feel like it at the moment, but it is better to be the one criticized than to become one who is critical. God pleads the case of the just. Criticism that is unkind hurts, but be certain that criticism hurts the critic more. Don’t be a critic. Being critical wounds a person’s spirit. It changes you and not for the better. Be aware. Hurting people hurt people. Don’t join that crowd; you won’t be happy. Jesus is a wonderful example. The Bible uses an even more hurtful word than criticism. “Who committed no sin, nor was deceit found in His mouth. Who, when He was reviled, did not revile in return; when He suffered, He did not threaten, but committed Himself to Him who judges righteously . . Do not repay evil for evil. Be careful to do what is right in the eyes of everybody.” Read 1 Peter 2:19-23 NKJV. But no matter how hard you try, nothing is acceptable to everyone. In those cases, “If it is possible, as far as depends on you, live at peace with everyone . . do not be overcome with evil, but overcome evil with good.” Read Romans 12:17-18, 21 NIV. The Bible is very clear but it’s instruction is not easy, “Don’t retaliate when people say unkind things about you. Instead, pay them back with a blessing. That is what God wants you to do, and He will bless you for it.” Read 1 Peter 3:9-12 NLT. Don’t be too quick to judge the critic before you judge the criticism. Often, there is a seed of truth buried in criticism that will make you wiser. The Holy Spirit can use criticism to help you examine your motives and methods a little more closely now and in the future. Today, I pray for you to let God keep your heart. On one occasion the Lord turned the heart of the King of Assyria so that he aided them in the construction of the Temple. On another occasion, he stirred the heart of Cyrus to release the Jews to return to Jerusalem. Nebuchadnezzar was considered to be the mightiest king of his generation. But God humbled and put him in “detention” for seven years. “The kingdom is the Lord’s, and He rules over the nations” (Psalms 22:28). You cannot quantify love accurately. “To us grace was given according to the measure of Christ’s gift.” Ephesians 4:7 NKJV. There are extremely few things in life that cannot be quantified by some form of measurement. You can measure time in seconds, minutes, hours, days, months, or years. You can measure distance in inches, feet, yards, or miles. You can measure weight in ounces, pounds, or tons. You can measure wealth in cents or dollars. But love is immeasurable, therefore indescribable. When our children were small, I would often ask them, “Do you know how much I love you?” Then I would stretch my arms out as far as I could reach and say, “I love you this much, and so much more!” Our love for that little boy and girl, and now their children and our great grandchildren, continues true yet today and remains as indescribable. And neither my love nor yours could claim to be comparable with God’s love for us. You cannot quantify love accurately. Jesus explained, “If you as sinful people know how to give good gifts to your children, how much more will your heavenly Father give the Holy Spirit to those who ask Him.” Read Luke 11:9-13 NLT. 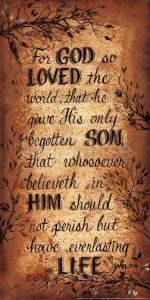 When John tried to describe God’s love, He could only write, “For God so loved the world that He gave His one and only Son, that whoever believes in Him shall not perish but have eternal life.” John 3:16 NIV. Love is best measured by the grace required for its expression. No wonder grace is described as amazing. 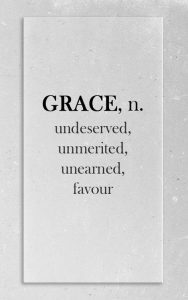 “To each one of us grace was given according to the measure of Christ’s gift.” Ephesians 4:7 NKJV. His love is immeasurable, His grace indescribable. “The riches of God’s grace that He lavished on us with all wisdom and understanding.” Read Ephesians 1:7-8 NIV. God’s love is without measure, His grace beyond description. “God demonstrates His own love for us in this: while we were still sinners, Christ died for us . .” Read Romans 5:6-11 NIV. To the Christians at Rome, Paul reasoned, “He Who did not spare His own Son, but gave Him up for us all – how will He not also, along with Him, graciously give us all things?” Romans 8:32 NIV. All things! His love that is immeasurable, and indescribable, and absolutely unchangeable. “Can anything ever separate us from Christ’s love?. . I am convinced that nothing can ever separate us from His love.” Read Romans 8:35-39 NLT. “And God is able to make all grace abound toward you, that you, always having all sufficiency in all things, may have an abundance for every good work.” 2 Corinthians 9:8 NKJV. Read it again slowly – all grace abounding, all sufficiency in all things, and abundance for every good work. In Christ, what do you lack? God’s love is incomparable, His grace sufficient, His forgiveness unfailing, His wisdom unequaled, His authority sovereign, His power limitless, and His provision overflowing. Yours and my love and grace should be in the likeness of His. “A new command I give you: Love one another. As I have loved you, so you must love one another.” Read John 13:34-35 NIV. Love is not optional for God, nor for you. Today, I pray for you to embrace God’s love fully and find His grace all sufficient.